I have been experimenting with using a Buddipole for portable operations. Details on the Buddipole can be found at this link. 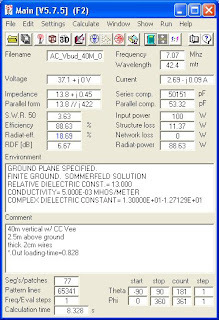 One configuration that is interesting is the 40m vertical as described in the Buddipole document at this link. I have used this and it tunes up very nicely, but I was also interested in seeing if I could model this configuration and possible find another more efficient configuration using other components. 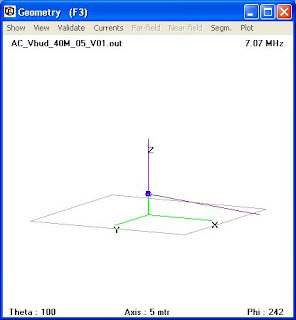 I loaded a copy of 4NEC2 and generated a few simple antennas, dipole, Inverted Vee, and a vertical. Setup is Versatee + Dipole Arm + Red Coil + Short Whip and 1 counterpoise. I use the TRSB at 1:1 setting. 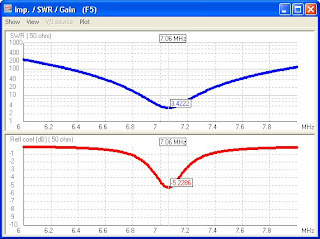 Key parameters: With the help of Dave KI6AWR, I am using a 28.2uH for the red coil. 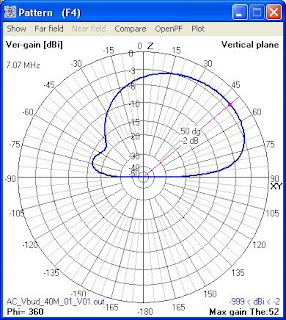 This prediction of this antenna can be made to resonate at 7.07MHz but the SWR of 3.4 is worse than I had observed in reality. Setup is Versatee +Red Coil + Dipole Arm 1 + Dipole Arm 2 + Long Whip and 1 counterpoise. In this configuration there the vertical is 1.4m longer due to the second dipole arm and the longer length of the long whip. Also the red coil has been placed at the bottom of the vertical. The counterpoise is unchanged, and the loading coil is tapped at 49% of its full value. 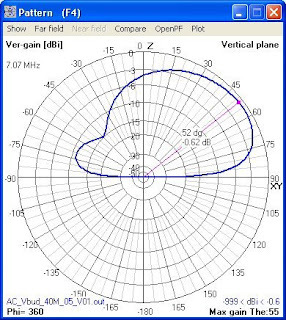 (this returns the antenna to resonance at 7.07MHz. There is expected to be 1.4dB more gain at the same takeoff angle of 50degrees. It should be possible to use a long whip and both dipole arms to extend the vertical. 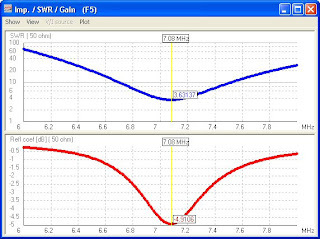 A bit more gain is expected and the red coil is expected to be at to 49% (20 of 41 turns) to compensate for the longer antenna. The counterpoise length does not need to be adjusted. a) I am unsure why the predicted SWRs are so high. I was expecting better than 2:1.